I had an awesome bowl of seafood egg noodle soup (mi do bien) at Hai Ky Mi Gia at Eden Center in Washington D.C. My friend got the dry version (mi kho) so I had a few bite of it too. I am now a fan of mi kho, especially the sauce that came with it! 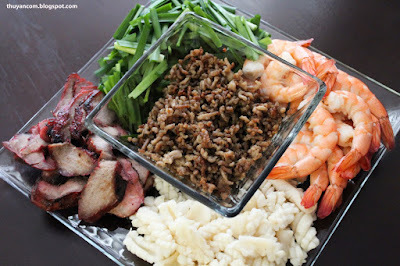 My intention for this weekend is to try to recreate the mi kho I had at HKMG. I just couldn't get the sauce right and the sauce really makes this dish. It’s a good thing I have a backup and made the broth version with hu tieu noodle. Hu Tieu is to south Vietnam as Pho is to the north, and Bun Bo Hue is to central Vietnam. Hu tieu stalls are EVERYWHERE in Saigon. There are so many version of hu tieu such as Nam Vang, My Tho, bo vien, xa xiu, do bien, and so on. I actually prefer some hu tieu to pho because I like having a variety of meat and toppings and of course the chewy texture of the noodle. I will continue to practice for the mi kho but until then enjoy a steamy bowl of hu tieu! 1. Rub bones with plenty of salt and rinse with cold water. simmer and remove as much scum as possible. 4. Add dried prawns,daikon, and yellow onion. 5. Taste broth with salt, rock sugar, and msg. 6. Let the broth sit for an hour or two. 7. Retaste broth, add fish sauce if needed. 1. Rub a little bit of salt on the pork. 2. 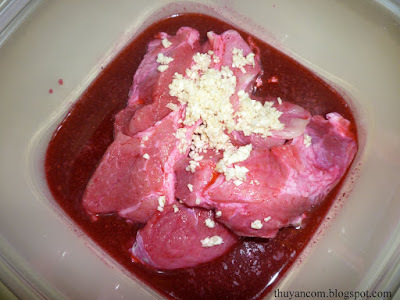 Combine garlic, five spice, sugar, water, and xa xiu seasoning to make a marinade. 3. Let pork shoulder marinade for as least 1-2 hours. 4. Then pan fry when ready to eat. 1. Use 1 can of quail eggs. Rinse and boil the eggs before eating. cook the squid by boiling in water. 3. 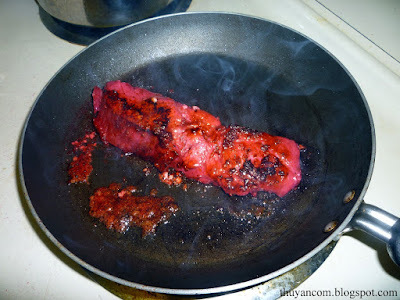 Sauteed 1/2 lb of ground pork with minced shallots, sugar, ground pepper, and fish sauce. 4. Prepare 1 lb of shrimp. I like cooking them in the microwave so it retains the sweetness. 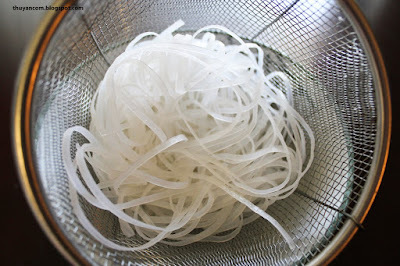 I use tapioca noodle from the asian market label as Hu Tieu My Tho. It doesn't require any boiling (but i'm sure it depends on the brand). I just soak it in warm water for 30-45 minutes. 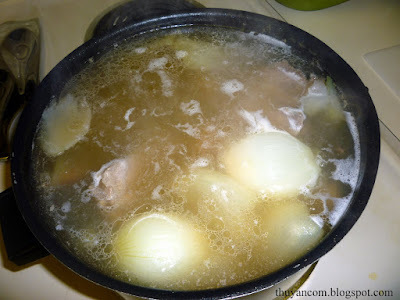 Once you pour hot broth over the noodle it will be soft and chewy. Thanks for the recipe. Did you ever figure out the recipe for the dry version? Did u ever find the recipe for the sauce yet? Thx. Yeah I've added this blog to favorites just because of the sauce ...if your able to crack the code I think you will be the first one. How many cups of water did u use to make the broth? I use a 6 quart pot, so I fill the pot with cleaned bones and then water.